Now that the growing season is underway, an abundance of life begins to spring up in our garden: seedlings take root and begin branching out, showing signs of their future production. But with new growth and life, comes the chance of pests finding their way into your garden. Some folks never have to deal with an infestation of pests—and hopefully you won’t either. When invasive species of insects happen to make their way into a garden, some folks rid them by spraying with pesticides. But I believe avoiding harmful pests by taking preventative measures and treating them using safe and natural methods is the best way to keep from harming your ground or your garden crop. The first line of defense to prevent insects from the beginning is to build and maintain a healthy soil. Healthy soil will provide your plants with all the oxygen and nutrients they need so they will better withstand the possible attack from pests. If you are rotating your crops every year, providing mulch and fertilizer, and even growing cover crops every couple of years, your soil will be in prime health and you will grow tenacious plants as a result. Even though pests can be very harmful, the healthiest gardens have bugs, and it can be a very good thing! The best advice I’ve heard is to fight bad bugs with good bugs. What I mean is to allow beneficial insects to populate your garden because they will not only ward off the harmful insects but promote healthy growth of current garden plants. The trick is to grow certain plants and flowers alongside your garden vegetables to attract these helpful bugs into your garden and to scare away harmful ones. Bronze Fennel – attracts minute pirate bugs which prey on spider mites and aphids. Wards off aphids, slugs, and snails. Bronze Fennel is invasive and should only be planted in containers and placed around your garden. Mint – attracts damsel bugs which prey on caterpillars, mites, potato beetles, cabbage worms. Mint plants are very invasive and should only be planted in containers like Fennel. Remove from garden before plants flower! Dill – attracts lady bugs which prey on aphids and white flies and wards off squash bugs, spider mites, cabbage loopers, and tomato hornworms. Dill is invasive in wet climates, so treat like mint in those regions. In dry climates, dill is more easily controlled. Marigolds – wards off mosquitos and aphids and attracts bees and wasps, which prey on caterpillars and aphids. Plant right next to tomatoes and peppers! Cilantro – attracts green lacewings (also attracted by dill), which prey on aphids, whiteflies, and mealybugs. Establish a patch somewhere outside your garden yet nearby and keep controlled. Zinnia– Will attract Soldier Beetles, which will prey on grasshoppers, one of the most damaging pests. Attracts bees and other vital pollinators. Although bees don’t prey on any insect, they are vital to your garden and the world at large. Vegetables that need bees to pollinate are broccoli, cabbage, melons, squash and apples, just to name a few. Just by having flowers around and in your garden, like marigolds, will make bees feel welcome, prompting them to work for you and your garden! But one of the most effective natural remedies is to dry a hot pepper and put its ground up flakes into a water and soap mixture. Spray the mixture around the plant and this should ward off all insects and rodents. However, understand that this will ward off beneficial insects as well. I recommend using ghost peppers if possible. All in all, you may experience pest problems this year or you may not. The point is to understand how a healthy garden depends on creating a suitable micro-environment with plant diversity and good garden practices. It may take a season to get your garden to the state you want it, but part of the joy in gardening is being rewarded for your patience. 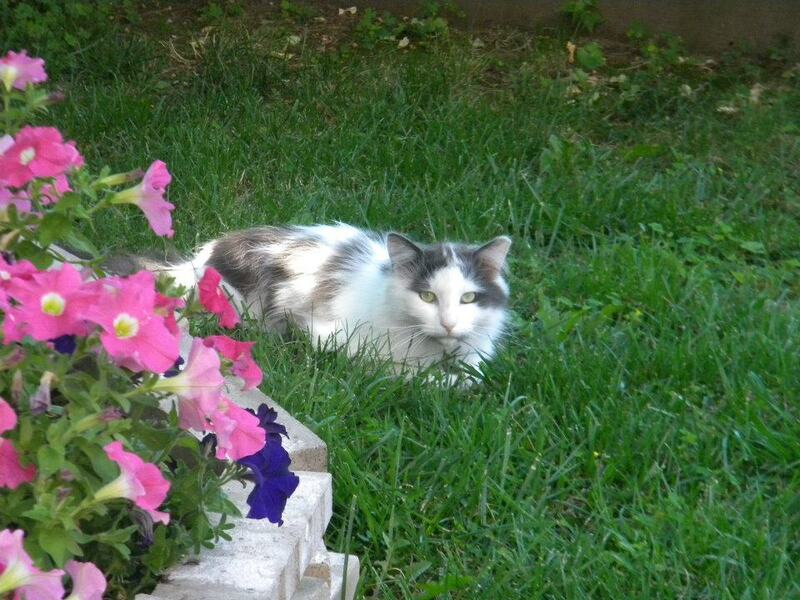 We also want to take this time to say good bye to our gardening partner, Wilson the Feral. For over 5 years you kept the yard and garden rodent free as well as keeping Angie and I company. And even though the garden is flourishing this year it seems empty with you not being there. R.I.P. Baby-boy.